Educational technology has become more accessible to schools and students.With these new digital epistemologies, what is the best way for teachers to incorporate the technology into their classrooms in order to develop 21st century skills? This research is designed to share current ideas and their impact on student learning as evidenced by increased engagement, assessment scores, and data collected from student work samples from classroom projects and activities. 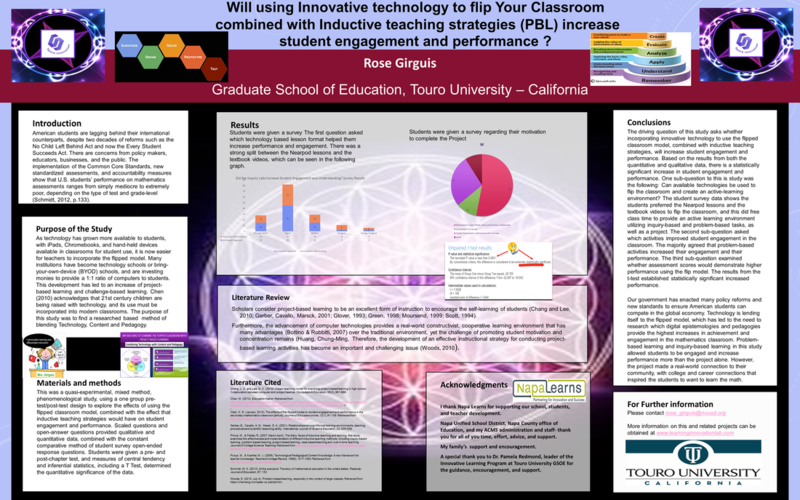 This project has shown a positive connection between the flipped classroom mode l(when combined with problem-based learning, inquiry-based learning, and project-based learning in a seventh-grade level mathematics classroom in Northern California) and student data showing increased performance and engagement. Research is required as new digital epistemologies and new teaching pedagogies arise,so that we can improve mathematics education and student performance.This paper goes beyond simply flipping the classroom, but examines a variety of learning activities to provide supporting evidence that mathematical performance and engagement will increase in three middle school mathematics classrooms in northern California. The goal of this research is to evaluate three flipped, public, middle school, seventh-grade mathematics classrooms utilizing active-learning activities during class time that increase student engagement and performance. Some theory and historical background of the flipped model have been outlined above,as well as the need for research and its importance. The focus now will shift to research behind active-learning tasks that have gained attention: inquiry-based learning, problem-based learning, project-based or challenge-based learning, and their impact on student performance. These are the current themes in education,and it is important to understand and apply new teaching pedagogies and technologies to enhance student learning and mathematics mastery. In inquiry-based teaching, the instructor poses a question, challenge,orreal-world problemprior toinstruction. Students are then asked more questionsin orderto facilitate deeper understanding. Bradford, Brown, and Cocking(2000) survey extensive neurological and psychological research that provides strong support for inductive teaching methods. The research demonstrates that inductive teaching methods encourage students to adopt a deep approach to learning (Ramsden,2003; Norman and Schmidt,1992; Coles,1985),and that the challenges provided by the inductive methods serve as precursors to intellectual development (Felder and Brent 2004). Inductive teaching methods encompass a variety of active-learning strategies, including discovery, inquiry-based, problem-based, project-based, case-based, and just-in-time teaching(Prince &Felder, 2007, para. 3). As technology develops it can be infused with these strategies to create powerful learning environments, that motivate students and allow students to engage with material and create ways of sharing and presenting their ideas using new innovative technology. Student-centered teaching and student motivation has propelled problem-based learning (PBL). Research findings from studies conducted in medical schools suggest that PBL may help to promote intrinsic motivational orientation(Pedersen, 2003, p. 3). Moore-West,Harington, Kaufman, and Skipper (1989) found that PBL students gave higher ratings than non-PBL students on a variety of topics, including meaningfulness, emotional climate, and student interactions. Dan Pink shows us how the intrinsically motivated students were able to solve the candle problem more quickly than the students that were extrinsically motivated,because motivation affects focus and the approach to problem-solving. Paris and Turner (1995) identified the characteristics of PBL that account for promoting intrinsically motivated students: choice, challenge, control, and peer collaboration.In the move towards the 21st century learning,the skill set of project based-learning activities now allow for creativity, collaboration, communication, and critical thinking.